Editor's note: Madeline Martinez is joining dozens of iReporters who are documenting their journeys from garden to table. Stay up to date on her progress toward a more fruitful way of life on iReport. Well before her diabetes diagnosis, Madeline Martinez knew her unhealthy eating habits were leading her down the wrong path. Martinez, a 49-year-old corporate travel agent in Miami, Florida, was 120 pounds overweight — the result of years resorting to fast-food dinners after long days at the office. When her endocrinologist delivered the news in February - Type 2 diabetes - she got serious. She ditched McDonald's and began shopping at Whole Foods and farmers' markets for organic produce. Then she went a step further and bought a shovel. Martinez was determined to find a solution to her destructive eating habits without breaking the bank. 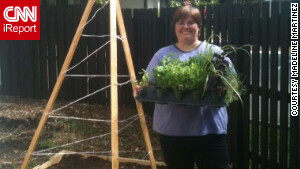 In early March, she picked up some plywood and got to work growing organic food right in her own backyard. Seeds for broccoli, cucumbers, tomatoes and lots of herbs went into the ground. “Home gardening has been in the back of my mind for a long time, but just like the diagnosis gave me the final push to change my eating habits, it also gave me the final push to farm my yard,” she told CNN iReport. Martinez is down at least 16 pounds and one dress size since her wake-up call in February - a milestone she attributes to both the easy access to vitamin-rich produce and the labors of tending her garden in the Miami heat. She hopes to eventually produce enough vegetables to fulfill at least half of her veggie needs. “My broccoli has bloomed, my cucumber has produced a beautiful, crunchy, refreshing and tasty salad ingredient, and my herbs are just going crazy,” she recently reported. And she’s found the benefits extend far beyond consumption. Martinez has become so passionate about the benefits of growing her own food that she’s spreading the green-thumb gospel to her nieces and the rest of the world. Great idea. Too bad people wait until they are diagnosed with a disease to change their lifestyle. We need to do a better job of teaching kids about good eating habits and the importance of exercise, so they will not develop diabetes or heart disease. Yes, I agree with you! Parents can set the best example for their own kids by having a healthy lifestyle including eating healthy foods like fruit and vegetables, exercising, and turning off the tv. Agreed here too. But every time, when some lawmakers try to impose some laws, people would whine the big government interfere their private life. The good example is the recent proposal of banning the big size of soda to sell in public or school in NY. And Michelle Obama constant gets attacks from the Conservatives for advocating eating healthy, parents don't need the government tell them what to do. Most of time, eat heathly is a common knowledge, unfortunately to some just don't get it. So it's the time for law makers step in to help before putting more burdens to our already broken system. To znhcats – I don't want the government dictating what I can eat! You expect government to fix everything. Let's tax potato chips and cookies and every other fattening food. Let the government dictate how big a coke is or how many fries we're allowed to eat. The government should tell us how we can eat healthy, and set guidelines, but they can keep their fingers out of our daily lives. People need to take some responsibility for themselves instead of thinking the government will fix everything wrong with society. The more power you give government over our daily lives, the more our government becomes a dictatorship. You don't have to be overweight to be diabetic. A lot of us were born this way, are not overweight, exercise every $%^& day whether we want to or not, and eat things a rabbit or goat would reject. Not my choice, not my lifestyle, I was born this way yet all the news media does is criticize all diabetics for being irresponsible. Couldn't agree more! My 8 year old son is diabetic and we often get looked at as if we cause it. In fact, at diagnosis (age 2), my monster-in-law said he got it because I had given him too much candy! Ignorance is everywhere! Best of luck with your diabetes! Education is the only way to inform the misinformed! Agree some of it is genetic but a lot of it is also related to the food you eat as in chemicals in the food, which your body is not able to process. Oh my, thank you so much for pointing this out to all the ones who ASSUME that all diabetics are the same. Never do I read anything that helps the ones of us who are born with the disease. Not because we are fat, lazy or watch too much tv. I quell anger everyday when push the oh, mightier, know it all's who preach lose this, do that and get up. For us with type 1 none of it makes any difference. I lost weight and I still take the same amount of insulin, suffer the complications no matter how much I've worked to keep the glucose down. I've had it since I was seven and have had to endure this all my life and keep the faith that, if you're gonna advise on something then know what the ect you're talking about folks! I think the article is for type II diabetes. The lady in the article has type 2 diabetes, caused in large part by her lifestyle. Type 1 diabetes is a whole different story. But everyone, with and without diabetes, would benefit from a healthier lifestyle. Type 1 is true diabetes. Type 2 is caused by being fat. Once they lose weight the metabolic disease goes away. How do you grow organic foods if you are using fertilizer bags from the store. You make a good point. I read this same article on another news station and they said she had been saving her poop from the fast food she ate for over ten years now. She has a huge sh it pile in her backyard and her neighbors let their children play in it for fun. Hello, ensense! That's a good point. To clarify, Madeline uses a mixture of organic compost and soil. We've just corrected the text. Thank you for your comment. I decompose all my kitchen wastes, grass clippers, and leaves together with newspaper at the end of my backyard, over the years it turn to be the great soils. Additional, after raking the leaves, I dump it over the newspaper/cardboard paper, the snow in winter helps the process of turning the waste into the great soils. I've never bought fertilizer from store, some of the "organic" soil is faked. Miracle is a good example, do some research. Actually, you can buy organic fertilizer at the hardware store. You'll find that many organic gardeners use blood meal, bone meal, fish emulsions, kelp sprays, and other organic products that can be bought in a bag. I think that many of the people commenting on this story are missing the point. While diabetes1 can be a tragic problem with no known triggers, Diabetes II is triggered by obesity. This story is about taking control and improving your health! I applaud her! Can wait until she tastes her first tomato! You go girl! Dolly the primary cause could be the various unnatural chemicals in the food Americans consume. Human bodies have yet to evolve to process them properly. Americans were not this way in the 40 and 60 when this type of food was not around. you need to check Joe Salatin on youtube you will understand. That is not correct. Diabetes can be caused my genetics or even medication. I was on a huge dosage of Prednisone steroid for an unrelated issue and it gave me the disease. I hate when uneducated people just spout out! Many things can make you prone to develop type II Diabetes-overweight, lack of exercise, eating too much sugar (not proven), drugs, and more. Some you can control, some you cannot. Some people can do all the wrong things and never have a problem, some can do all the right things and develop diabetes. This is one things that makes Type II diabetes hard to get a handle on. Jake, I think you did a great job writing this article! It is very inspiring to me...it motivates me to get out in the sun and start growing my own fruits/veggies! Well done! has relieved headechas i used to get on a daily basis, i havnt slept better in my entire life than i have during my time taking it and i just feel stronger and all around healthier, i strongly advise this to anybody who smokes, has consistent headechas, trouble sleeping or even just aches and pains, the results dont come instantly but after about 2 weeks of drinking the tea compound you will notice a difference! I'm not sure how this thing of growing your own fruit and veggies works! I mean not everyone can do it and what about meat, do you hunt? What about toxins in your house, do you move in a cave? I do believe that the whole society should be educated to eat healthy and not allow Junk Food Corporations run our politicians and our lives. Just because you can't make life perfect doesn't mean you can't change small parts for the better. Just because she's not hunting her own game doesn't mean that growing a garden isn't a positive change in her life. You can be super fit, lean, strong and eat very carefully and still develop diabetes later in life. Not all adult onset diabetes comes from irresponsible abuse of your body. This has nothing to do with the above story and is self serving. Best wishes, and keep up the good work, Ms. Martinez! Bravo Madeline! I was diagnosed with type II diabetes last June and this year I also started my first garden. I made it a project that both my youngest son and I could enjoy together. It promotes bonding and a healthy lifestyle that I hope he continues into adulthood. It is absolutely false that you must be over weight to be a type II diabetic. If that were true so many more people across the world would have the disease and if they lost weight it would go away. I have lost more than 50 pounds since being diagnosed last last June and I still have diabetes and will for the rest of my life (I now weight 154 pounds and people are telling me I need to eat as I look too thin!! Never thought I would ever hear someone tell me that!). In my case diabetes is also genetic. I have cut back considerably on sugar and fat in my diet, but I still eat carbs in moderation, and no I do not exercise but I am going to start walking soon. Hope your garden, and mine, are blessed with bountiful harvests. Best of luck to you. Don't be discouraged. If you include some excercise on a daily basis your numbers will look so much better. I am type II diabetic as well, have lost 81 pounds in two years by changing my diet and 1hr long daily walks during work week, and longer walks on weekends. I would recommend trying zumba as well – I do it at home at least twice a week, its fun and a great cardio. Try not to eat anything to heavy after 5pm – maybe just fruit, nuts or yogurt to satisfy your cravings- my numbers in the morning look much better now. Drink lots of water and avoid diet drinks, yes diet – they are very bad for us type II diabetics. Good Luck! It's true, I have been a vegan for years and I'm 72 in good health. People should grow their own vegs and fruit in their gardens...not only will it benefit their health and save them money but it's a pleasant, satisfying and gratifying experience too. This author has not grown the vegetables shown. This story is poop. This is such a great story. It is always encouraging when people choose to live healthier lifestyles. Diabetes is a hard disease to live with but there are always steps you can take to live better. Delta Dental of Iowa has an informative blog about diabetes and oral health. Here's the problem. If your diabetic – Healthy foods are bad for you.........Vegetables translate (for the most part) into Carbs......so don't kid yourself, healthy foods are bad foods for diabetics. Your comment is not entirely true. Being a diabetic, I stay away from rice, pasta, and breads. I do eat a lot of chicken chicken, beef, fish, and certain vegetables such as broccoli and cauliflower. There are some vegetables that should be eaten in moderation such as corn which is high in carbs. Low fat cheeses, low glycemic fruits, low carb yogurt, along with nuts can all be eaten without a problem. But, no two diabetics are exactly the same. What bothers one person may not bother another. The best thing you can do is monitor your blood sugars and adjust accordingly. My father previously had type II diabetes, started eating fruits, vegatables, whole grains, legumes, no oil. Eats a whole food plant based diet and has reversed his diabetes. Growing garden fresh vegie and fruits tests best and I don't have to explain the health benefits of it, but it is a great exercise for the whole body as well. Also, walking helps a lot for Type 2 diabeties patients. 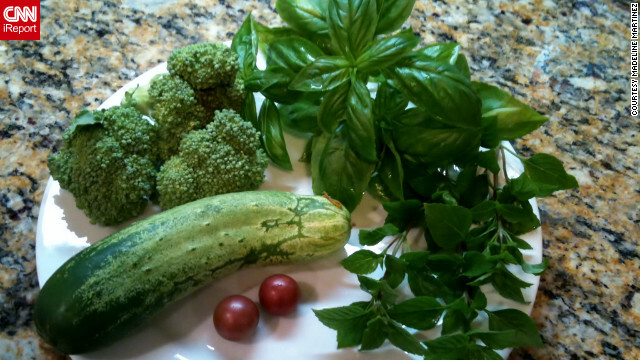 Emil – I think u haven't seen garden fresh vegetables, otherwise you won't question the validity of it. I'm 49 years old. ive years ago I was diagnosed with Type 2 Diabetes, high blood pressure and off the scale high cholesterol and tryglycerides. I'm 5'4 and weigh 117 pounds. Metobolic Syndrome they called it. And yes, I eat right and exercise. I've been a vegetarian for 16 years and teach yoga and cross training at the YMCA. 18 months ago I was diagnosed with the autoimune disease Dermatomyositis. Frinally realized the disease had wrecked my immune system and that's why I had developed Metabolic Syndrome. I also had gestational diabetes with both of my pregnancies. Sorry. I only gained 20 pounds with both pregnancies but they told me, even back then, since I had gestational diabetes, I had an 80% chance of developing Type 2 Diabetes. The doctor told me to stay slim and fit. Weird that it came true but not because I became overweight, etc. What an inspiring story and congrats to Ms Martinez for taking control of her diabetes the right way. If more people ditched the fast food and started eating more fresh, organic veggies from their own backyard garden, then this world would be a heck of a lot healthier.